I started with a push mower too! I started with a Murray push mower from Walmart and used it to mow a cemetery that I could walk to down the road from my parents. I used this push mower for a couple of season and the handle broke at the base. Next purchase was a snapper rear engine rider with a 28-inch cut and an 8 hp Briggs and Stratton engine. Used this mower for a season and then got my first commercial account. This was large nursing home with apartment buildings. The rear engine rider had a rubber disk that slid to increase the speed of the mower and I was burning through several a season, then the spacer for the rear axle started to wear and needed to be replaced. This is when I stepped up to a 36 commercial belt drive walk behind. The large acreage commercial account was wearing me out walking the entire place so I bought a velke sulky to be able to increase my productivity and reduce fatigue. Started getting more customers and then upgraded to a 48 inch hydro walk behind and transferred the velke over to the new mower. The only way to realize that you don’t know what you don’t know is to learn. Books, mentor, youtube,…etc. can help. 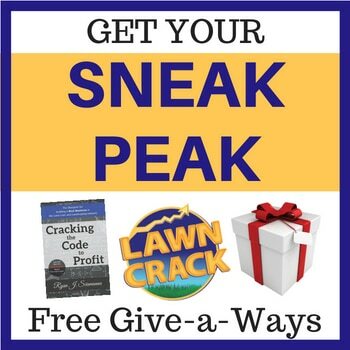 https://lawncrack.com/best-books-for-lawn-care-and-landscape-business-owners Doing the same thing over and over and expecting a different result is insanity, don’t be insane! This is where you should consider getting a business coach (https://lawncrack.com/lawn-care-business-coaching/) because it is cheaper than trying to learn everything the hard way. Time is money, and nothing is free in this world. The time that it takes to learn and apply self-taught knowledge takes longer. When you get a business coach they can shorten the time it takes thereby increasing your revenue and making you money faster. This is a prime example of you don’t know what you don’t know. Did you know that you are losing out on potential sales? When you have a professionally built website that is a 24 hour a day 7 days a week salesman creating leads to funnel into potential clients working for you, the price is ridiculously cheap to have someone build it for you. 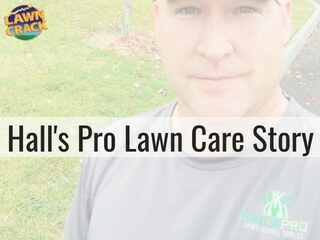 https://lawncrack.com/websites-lawn-care-companies/ You can build the website yourself, but it needs to rank well in organic search results, have great copy (words on the page) and have a strong call to action for the potential customer to call, email, fill out form to ask for an estimate or even better sign up on the spot with a credit card and start a relationship with your company. This is when time is money….time spent in learning how to build a great website or spend the money to make a lot more money. Being a business owner one must think in terms of ROI (Return on Investment) If I spend $1250 on a website that generates $50,000 to $200,000 in new leads each year, well that would have been nice to know, but you don’t know what you don’t know. When I say don’t subsidize customers, what I am really saying is price correctly and track job times. What happens when you don’t track job times, you can’t do job costing. Every single account costs you money to perform the work. When you track each and every job you can see if you bid incorrectly, are under-performing or made a profit. What happens when you do a guesstimate is that you make money on some, lose money on others and break even on some. The break-even and lose money cancel out most of the profitable jobs. In essence, you are working harder for less money because you are not job costing. What activity do you perform to generate revenue? Cutting grass is the example of lawn mowing. What function do you do that does not create revenue? The list is long: Fuel: How can you reduce trips to the gas station? Grease mowers: Some mowers have non-greaseable spindles, casters, etc. Mowing Route: How can you reduce drive time? Vehicle Maintenance: How can you reduce equipment maintenance? Trimmer String: Cut and wind string for a fast refill and keep it in your pocket. Customers: How can you eliminate callbacks, complaints, or phone calls? How do you automate invoicing? This is a solution I come up with after having 6 customers not paying in one season and dealing with slow payers. Pre-pay or pay at the time of service. No Money, No Mow Policy! Customers can leave payment at their residence if you are a solo operator. If you are a larger company having a credit card on file is the way to go from the start. Automating marketing for a solo operation by incentivize customers friends or family by doing quality work at a fair price and also to reward referrals with a cash or gift card. Set a policy in place to have at least 4 mows or a month of service for the reward to keep from gaming the system. Focusing on customer count is not the best indicator of making a profit. You can have a million dollar business with 1000 customers that only produces a 5% profit margin and make $50,000. Or you can have a $90,000 business with 60 customers with a 60% profit margin and make $54,000. Totally doable as a solo operator. Do you want to make more than $54,000 a year? Then multiple crews should be an option. This is where it gets tricky. Multiple crews increase income, but only if done correctly. https://lawncrack.com/percentage-pay-lawn-care-industry/ is a great article about paying employees. Big thanks to Josh Hall for writing this up for us! 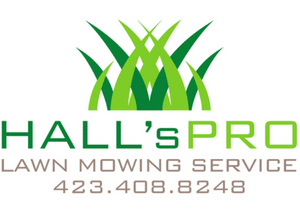 Check his website out at http://hallspro.com or find him on Facebook at https://www.facebook.com/HallsProMowing/.